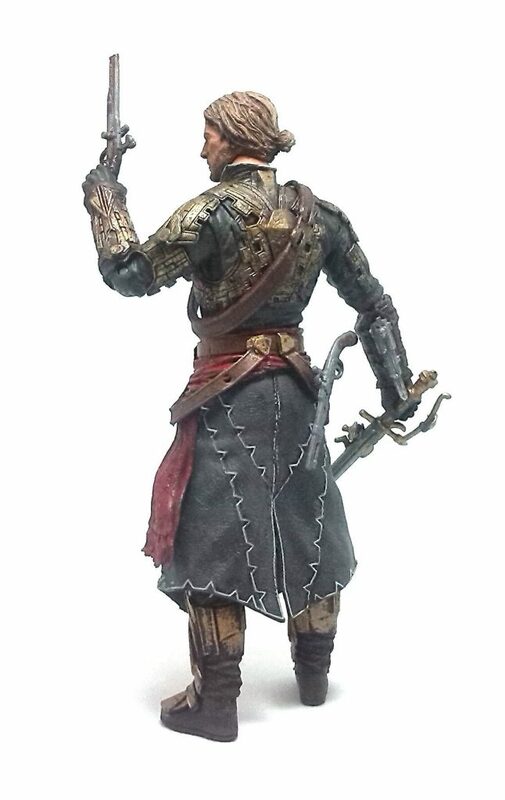 Even though my advance in the Assassin’s Creed games is deliberately slow (I have to complete any and all optional missions), that has not prevented me from picking up the odd McFarlane action figure based on this IP that happens to cross my path. One of my latest acquisitions comes from AC IV: Black Flag, and it is this version of Edward Kenway in his Mayan inspired outfit. Of course, this is an artistic interpretation, as Mayans really did not dress like this nor had a working knowledge of metal armor manufacturing. 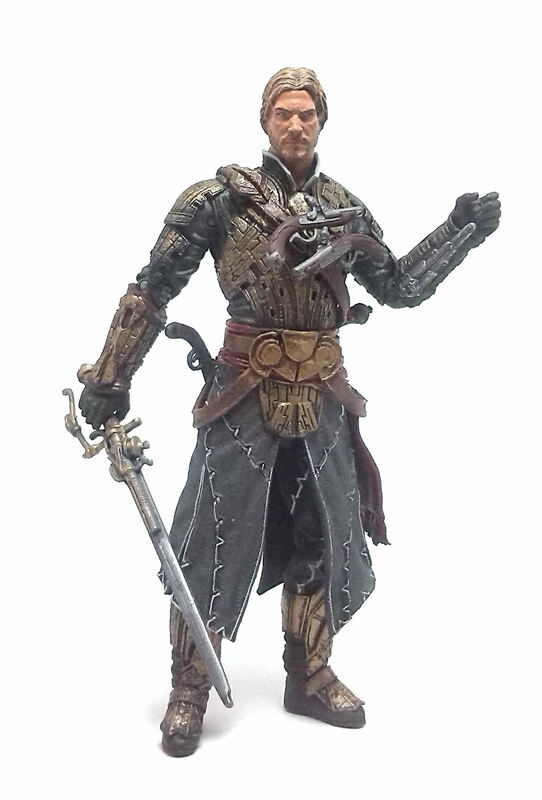 Since this version of Edward has no hood, we get to see a fully sculpted face on this figure, which reminds me somewhat the face of actor Iain Glen, who has worked in a lot of projects although I remember him mostly from the first Lara Croft movie or, more recently, the Game of Thrones HBO series. The garments’ sculpt is very detailed, from the numerous stitching on the clothes to the etched lines on the metallic armor plates. The outfit is composed of several independent pieces glued together to provide a nicely layered appearance. • Pin & disk knees. The legs are the ones that fare worst in terms of movement range because of the long skirt piece, although there is just enough to easily balance the figure. 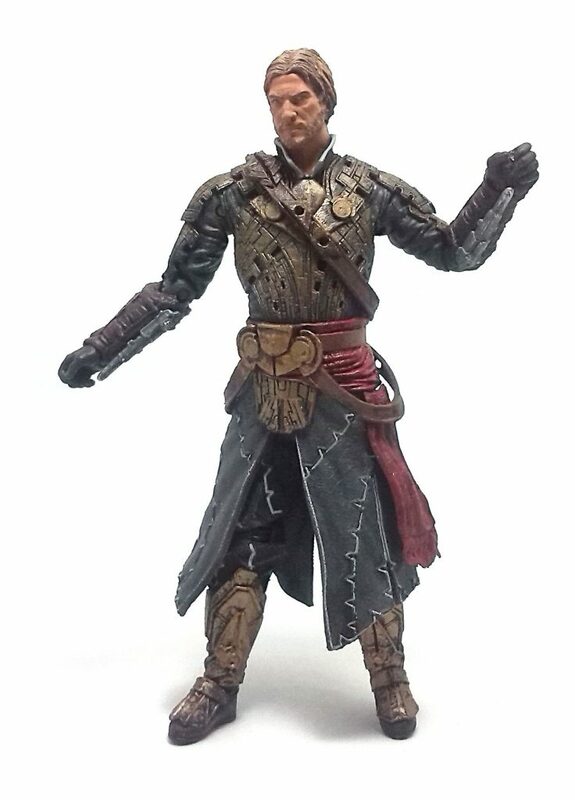 The paint job on my Edward Kenway figure is excellent. The color palette is very subdued, but all colors seem neatly applied. The part I liked the most is the is the detailing on the brass armor plates, which look very realistic, and even some of his weapons have tiny decorative golden curlicues. 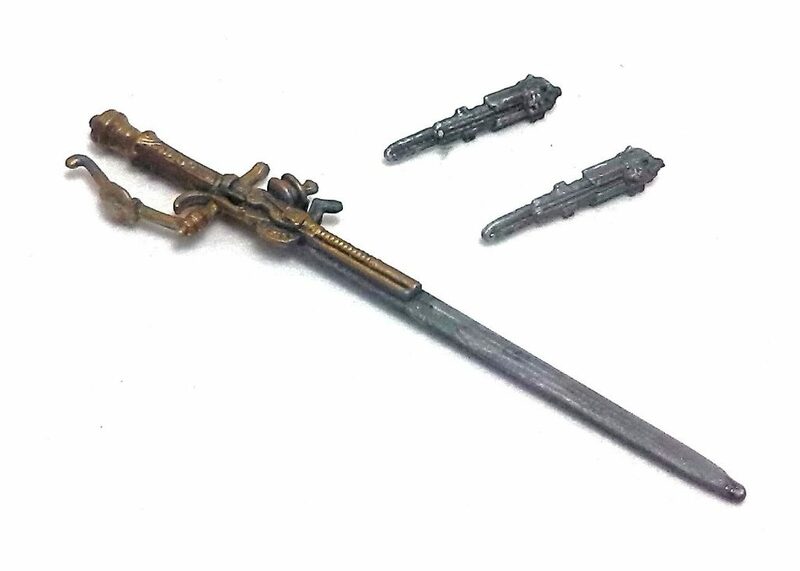 Speaking of which, Edward Kenway comes heavily armed, with a couple of hidden blades (which don’t seem to be fully extended, but neither fully retracted), four flintlock pistols (two large, two small) and a sword that seems to have yet another small firearm sculpted as part of the sword guard. 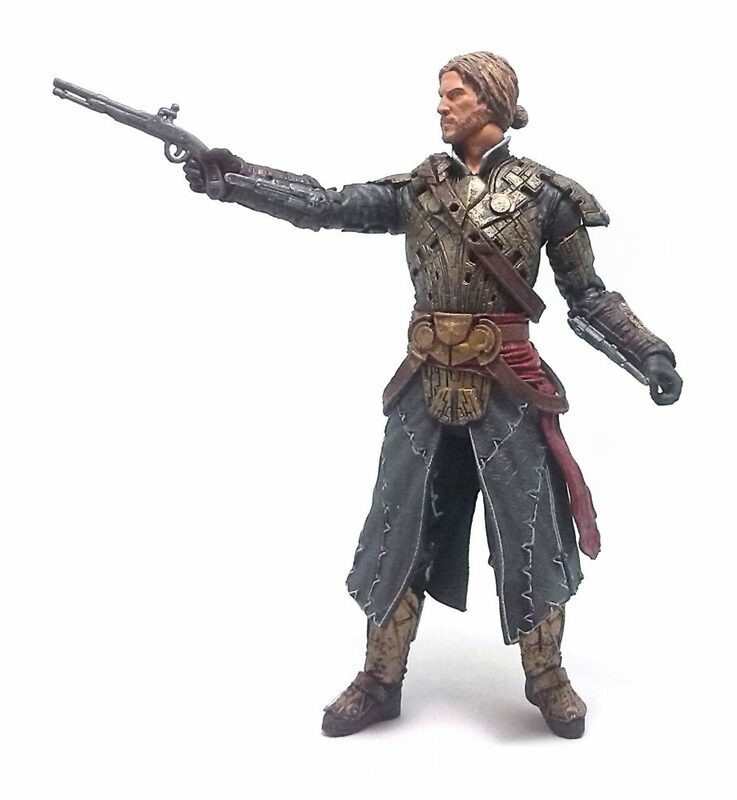 Edward Kenway can carry most of his weapons on him, using peg holes sculpted on both belt and baldric to attach the pistols, the holes in the bracers for the hidden blades, and finally brandishing his gun/sword in either hand. In closing, I must say I was pretty impressed by how this character turned out, and I look forward to actually play the game Edward Kenway comes from.